Caregivers can use books for much more than simply reading the written story to their children. Playing with books is a great way to increase communication with kids, spark their imagination, and get them to use their critical thinking skills. Next time you pull out a book try one of the below activities to make the reading experience more interactive and fun! Reading the same book again and again isn’t boring for your child. In fact, kids love seeing their favorite book repeatedly for several reasons. First, reading a book over and over helps children predict language….Second when kids know what is coming next, you can let them “fill in the blank” when reading, which helps them recognize and understand more words. Finally, kids can help you read the book by looking at and describing the pictures that are familiar to them. Some books have flaps that cover pictures or words on the page. These are great books to use with young kids. To help them use their words as your children what they think might be hiding under the flap. Flap books are also a great way to work on “Wh” questions (who, what, where) while reading. By asking kids what they think is under the flap, you are teaching them how to make predictions and guess what might be under the flap. This also helps them predict what will happen next in the story. Make your I Spy games as simple or challenging as you’d like. Use these books to work on taking turns; you take a turn to find an item and then your child gets to find an item. Kids can work on prepositional phrases when talking about the location of items in the I Spy books. You can encourage kids to do this by asking questions like, What is the car next to? What is above the dog? Re-tell the story; can your child tell you what happened in the book? Help them learn to answer questions by asking them about the pictures in the book; i.e. What is the girl wearing? Where is the dog going? Want even more ideas for reading books together? Try these 7 ideas for making story time fun! Happy Reading!!!!! At first parents may have concerns about teaching their children multiple languages, but there are many benefits of being bilingual. It’s a great idea to make reading aloud part of your family’s daily routine. 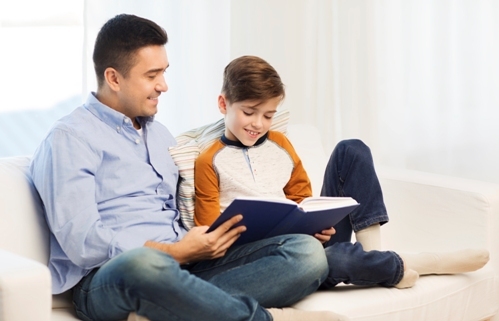 But did you know moms and dads can have different reading styles? Previous Previous post: My Child Hits. Why?